Find inspiration in your ordinary (or extraordinary) day! Take a photo.. The view from here #WBDPhotoChallenge is not unlike other photo-a-day challenges where participants draw inspiration from their ordinary lives, snap a photo and share with others. What is different about the #WBDPhotoChallenge is that each inspired image will be from the perspective of people with disability. International Wishbone Day is fast approaching with only 3 months to go! The view from here #WBDPhotoChallenge is a fun and creative contribution to our international efforts to bring awareness to the diversity of life with disability. When you view images from the #WBDPhotoChallenge you will see the world through the eyes of ordinary people with disability. Who can participate in the #WBDPhotoChallenge? Anyone with disability can participate in the challenge. Do my images need to be disability focused? No. Inspiration for the #WBDPhotoChallenge should be drawn from your ordinary day. The photo challenge will illustrate how ordinary life with disability really is. Can my images be disability focused? Of course! Your perspective is the key. How do I share my #WBDPhotoChallenge photos? You can share your photos on Instagram, Facebook, Pinterest, or twitter by including the hashtag #WBDPhotoChallenge. 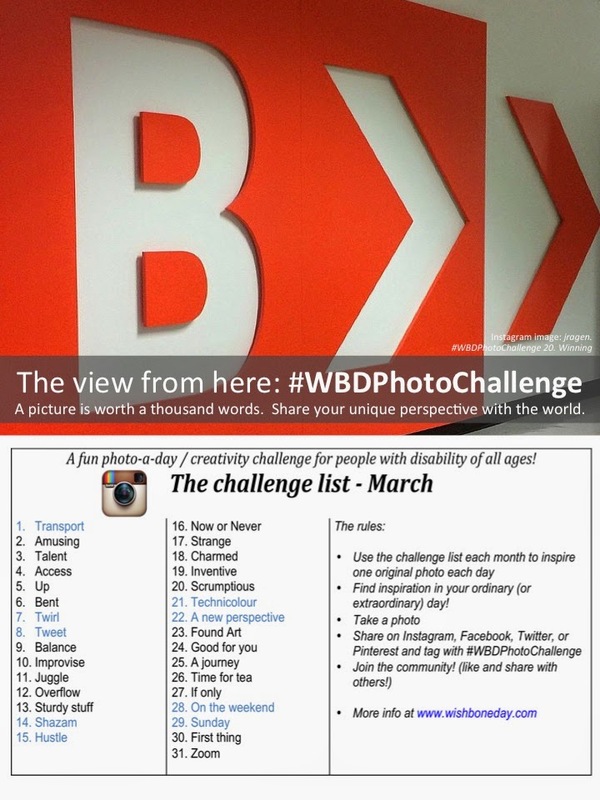 You can also view other peoples photos by searching for the #WBDPhotoChallenge hashtag. Will others be able to see my #WBDPhotoChallenge images? That is up to you. You decide if you share your pictures publicly or privately on your social media site. If you want others to view your #WBDPhotoChallenge (including us) then set your privacy setting on your images to public. What if I miss a day on the challenge? No problem. There are no rules to how you participate. If you miss a day or two or a few, don't stress. Just start back when you're ready. You can decide if you post catch-up photos or just start back on the next day. You decide. The idea is to have fun. No. Just start. Post your images with the #WBDPhotoChallenge. When will the challenge list be available? The challenge list will be available on the last Sunday of each month. You'll find the challenge list here on our website. Meet Mitch St. Pierre, a Canadian filmmaker with OI who decided to leave his home country and set up in the decidedly more adventurous surroundings of Siem Reap, Cambodia. If fundraising is your motivation for taking part in Wishbone Day, you've missed the point. Shut up and dance! Its Wishbone Day!! People should celebrate Wishbone Day because it's a party for my bones! Wishbone Day has international copy protection. 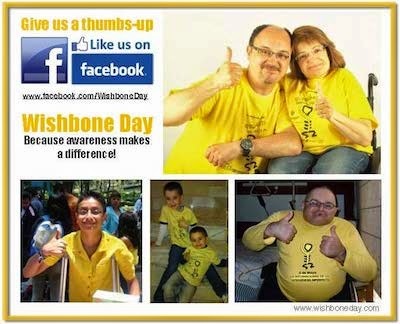 When engaging and promoting Wishbone Day and OI awareness please do so in the spirit it is intended. You can read more about our terms here. © All Rights Reserved. 2018. Simple theme. Powered by Blogger.